The babylonian day starts and finishes with the sunset. The night is first, then follows the day. Night was divided in 6 equal hours. And the same for the day. The transition between night and day are powerful events when the celestial firmament is lucid with all colors of the rainbow. The sunset and the sunrise are processes of up to 2 hours of duration. 40 minutes before the Sun rises, its halo around the horizon has all colors of the rainbow. After 20 more minutes, the whole horizon is encircled with a true, gigantic rainbow. At this moment the swallows swirl and chirp high in the sky, celebrating the new day. The babylonian astrologer looks at the sky with eyes of an artist. If he sees a planet rising in the powerful solar halo, he will see a jewel in the crown of the Sun. He will see this as an omen for the day that follows. If this happens on the sunrise of the first day of the year, he will see this as an omen for the whole year. The first of every month was the day when the NewCrescent of the Moon was observed for the first time after being invisible. How does the first lunar sickle look? What color? Does it come up high or low in altitude? How much time is it observed until it sets? Where do its horns point to? Do planets or stars show up in its vicinity? All these is observed and recorded in a state more meditational than inquisitive. The sunset of the first appearance of the NewCrescent is the omen of the month that follows. As the sunset of each day is the omen of the night that follows. The time of the NewCrescent and the remaining babylonian lunar phases and also the time of appearance of the planets and the stars may be quite different for different latitudes and longitudes. The first of each babylonian month for Israel and Canada may be days apart. More than that! Clouds, storms, winds and other weather and atmospheric phenomena are taken in account as well. This all makes Babylonian Astrology impossible without the personal, direct observation of the astrologer. And what he sees is valid only for his city, since the NewCrescent may appear bright at one place and dim 20 miles away. The most important time for observations in Babylonian Astrology is the time of the sunset and sunrise. Not the moment of the visual sunset and sunrise- when the Sun is exactly at the horizon, but the whole process of the light-transformation of the sky that may be more than 2 hours in duration. If the astrologer sees planets or stars rising on the east during the process of the sunrise, he will see them in the solar light-halo and on different background of color depending on the brightness of the planet or star. Venus on the day of its first morning appearance, coming up around 30 minutes before visual sunrise, will be seen on the background of a lucid orange sky, only 2 or 3 degrees above horizon- a most powerful experience. Mercury may be seen on yellow-green background, one hour before visual sunrise. The same applies for the sunset, but if we see planets close to the solar sunset-halo, these planets will be 'evening stars'. At the present moment (February-March 2000), Mars, Jupiter and Saturn can be seen on the west after sunset. 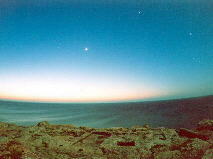 Venus can be still seen as a 'morning star'. In addition to these heliacal phases, the planets and the stars have others, that are taken in account in the Babylonian Astrology. Altogether, Venus and Mercury may have 6; Jupiter, Mars and Saturn - 8 and the stars - 6 distinct heliacal phases. The Moon also has 6 different heliacal phases and consequently the babylonian month is divided into 6 periods. We should underline and remember that the babylonian lunar phases have little in common with the lunar phases of the present age1. The babylonian first day of the new year is Nisan 1, when the NewCrescent is being observed for the first time with the Sun being in tropical Aries. The sunset and sunrise on that day are observed carefully, since they both are the omens of the whole year that follows. The heliacal phases of the planets, the colors, intensity and brightness of the solar halo, the atmospheric conditions, the clouds and the winds on that day are extremely important. With this I will conclude the present article. Whoever wants to know more is welcomed to contact me. 1) In Tetrabiblos there are plenty of traces from Babylonian Astrology. In fact, we cannot fully understand Ptolemy if we do not know Babylonian Astrology. In book I, chapter 8, Ptolemy describes the temperament and influences of the Moon in her different phases. Unfortunately the word anatolh (h) meaning 'Rise' is translated as NewMoon in many translations. It should be NewCrescent. Cardan in his commentaries of Tetrabiblos translates it correctly as oriens (Rise). The NewCrescent is the appearance of the lunar crescent shortly after sunset on the west.